Throw blankets, like accent pillows, are a great way to add a color to your home without having to completely redecorate. They can add a pop of color or make the room feel more relaxing by emphasizing soft neutral hues. Plush throw blankets add warm cozy touches and can make a room feel homey and welcoming, and knit blankets are some of the most popular blankets out there. A throw blanket is a bit smaller than regular blankets. Typically, they are 50-inches by 60-inches and are just the right size for one person. Throws are perfect for curling up in a chair with a good book and a cup of tea, or pull one over your legs to ward off the chill of winter. Throw blankets come in so many gorgeous designs that you're sure to find the perfect blankets to go with your décor. Drape your new throws across the back of your sofa. Place them in your chairs as a protective barrier for your seat cushions, or use a colorful throw to brighten up neutral décor. Grab a colorful throw and drape it over the back of the chair for a cute way to incorporate accent colors into your home. Of course, one of the most classic ways to incorporate a throw blanket into your home by placing one at the foot of your bed. Perk up the personality of your outdoor furniture by decorating with a lush faux fur throw which will also make the evenings in the cooler air a more comfortable place to be. Find down puffer throws for a super cuddly blanket, look for a printed throw to add a touch of fun, or bundle up with an ultra-soft microfiber blanket. JCPenney has something for every taste and style. Warm and cozy blankets made from microfleece are so cuddly, you'll just want to wrap yourself up in them. Look for all the colors and styles from throws to full-size blankets. A cotton blanket is a lighter choice when you don't want something super warm but still want an extra layer. A quilted down-alternative blanket gives you the pillowy softness of a down blanket without the potential allergens. 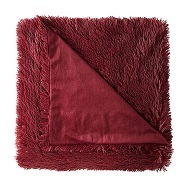 Find soft velour blankets in solids or prints, or decorate with a fringed throw. Electric blankets are a great way to ward off the chill. 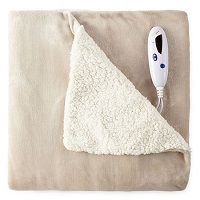 When you feel the cold deep in your bones, plug in a soft and fuzzy electric blanket to keep that cold away. Use it to warm up your bed or chair before you settle in, or feel it work the winter out of your joints to keep you moving freely and feeling good. Look for soft plush electric blankets in a rainbow of solid colors to complement your décor. 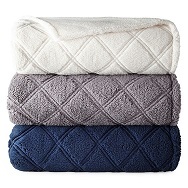 JCPenney has such a wide selection of blankets and throws, you can be sure to find one that suits your needs. From solid colors to fun printed throws and seasonal themes, we've got a blanket to keep you warm. Bring on the cold weather!